Do you ever struggle with what to do with the mounds of important paperwork that you need to keep? What about the bills and other random miscellany that arrives in your mailbox each day? Managing a household of seven people keeps me on my toes at all times, which sometimes leaves me behind on managing our paperwork. After being married for three-and-a-half years, I can say that my husband and I have found a system of organization that truly works for us; but not only does it work, it flows. When it comes to the really important paperwork (like our written wills, birth certificates, mortgage documents, etc. ), those are safely filed away in our fireproof/waterproof safe in our storage room. The key to this safe is safely tucked away, too - somewhere very safe, I promise! I'm sure that you've all figured out your systems for paperwork, too - but what about the daily stuff that comes up, but can't be forgotten (can anybody say that dreaded word: BILLS!)? 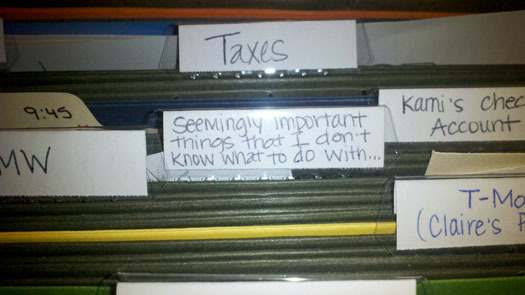 This is where my overly-organized self found a system of filing that works for us! See? The first two files are for the bills that come and go - the first folder being the ones that are due anywhere from the 1st to the 15th of the month, the second being for the ones that are due anywhere from the 16th to the 31st of the month. When I open the mail and come across these bills, I immediately put them in their appropriate folders. This way I don't lose them and I don't forget to pay them - they're right where they need to be (and on the rare occasion that our schedules have been overly crazy and I'm not home when they need to be paid, I can easily communicate to Monte where they are and he can take care of it with ease!). If there is any form of paperwork that we need easy access to, you can guarantee it has a folder: medical receipts, our cell phone bills and contracts, owners manuals, the current contracts for our kitchen upgrade, various health forms for Ethan ... you name it, there's a spot for it! 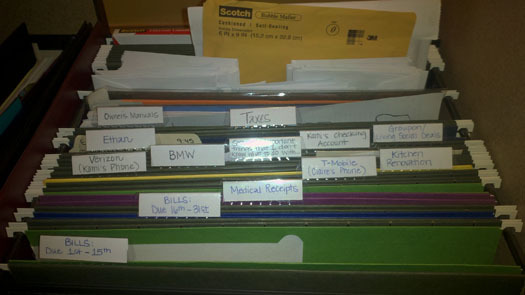 This filing system is one that has worked for us and helped us out immensely! Do you have any tips you can share with me (I love to learn new organization ideas!)? Are you interested in finding more suggestions to manage that out-of-control paperwork? 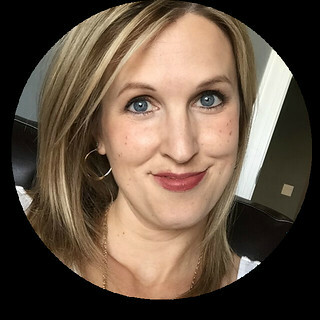 Visit BlogHer's Life Well Lived page to hear what others had to say! Don't forget to enter the Life Well Lived Sweepstakes for a chance to win an iPod touch and a $50 iTunes gift card!! Thank you for taking time to comment! I love hearing from each and every one of you. Please be courteous and respectful with the things you say. I am a child of God, saved by grace through faith in Jesus. I am a wife to one amazing man and mom to five amazing kids (4 by marriage). I really, really like high heels, french-pressed coffee, health and fitness, dark chocolate, scrapbooking, reading, cooking, and finding a pair of jeans that fits just right! Come join me on my blog as I take you along on the ride of my lifetime! Just A Wife. Just A Mom.